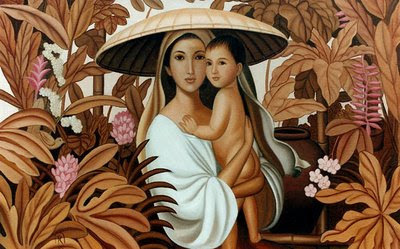 Our Lady of the Philippines, shamelessly pinched from here. In A Christmas Memory, Truman Capote relates the story of a kid, Buddy, and his friend, a grandmother figure, the only person in his life who knows a little boy should get a kite and not underwear and prayer books for Christmas. The wind is blowing, and nothing will do till we've run to a Pasture below the house where Queenie has scooted to bury her bone (and where, a winter hence, Queenie will be buried, too). There, plunging through the healthy waist-high grass, we unreel our kites, feel them twitching at the string like sky fish as they swim into the wind. Satisfied, sun-warmed, we sprawl in the grass and peel Satsumas and watch our kites cavort. Soon I forget the socks and hand-me-down sweater. I'm as happy as if we'd already won the fifty-thousand-dollar Grand Prize in that coffee-naming contest. "My, how foolish I am!" my friend cries, suddenly alert, like a woman remembering too late she has biscuits in the oven. "You know what I've always thought?" she asks in a tone of discovery and not smiling at me but a point beyond. "I've always thought a body would have to be sick and dying before they saw the Lord. And I imagined that when he came it would be like looking at the Baptist window: pretty as colored glass with the sun pouring through, such a shine you don't know it's getting dark. And it's been a comfort: to think of that shine taking away all the spooky feeling. But I'11 wager it never happens. I'11 wager at the very end a body realizes the Lord has already shown Himself. That things as they are"—her hand circles in a gesture that gathers clouds and kites and grass and Queenie pawing earth over her bone—"just what they've always seen, was seeing Him. As for me, I could leave the world with today in my eyes."